Being neighbors with 588 kilometers of the border and having common cultural and economic relationships, Latvia and Lithuania can improve their competitiveness and influence in the global business market. It can be achieved by improvement of cooperation in both countries and establishment of business support system coordination. 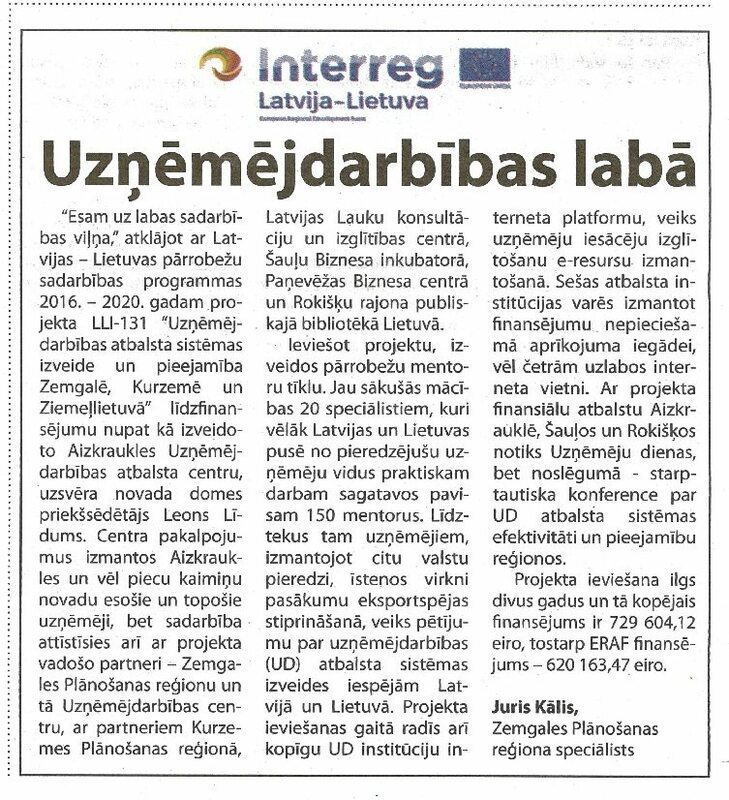 Project will be implemented in cooperation with various business support providers of Latvia and Lithuania, what will ensure broader view of business promotion solutions and services in the cross border territory. The project aim is to promote business development, providing support services and strengthening cooperation between business support institutions, thus contributing viability of the business ideas focusing on business start-ups and self-employment. 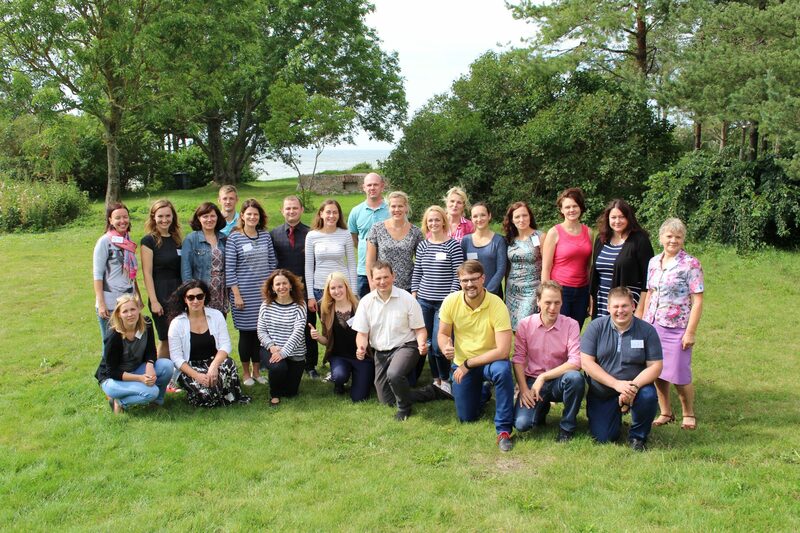 During project life cycle it will be analyzed strengths and weaknesses of business support services and business support system implementation possibilities in Latvia and Lithuania resulting with workshops and trainings to set the beast approaches and needs for business development activities in partner territories. Technical infrastructure will be improved including ICT tools which will improve information availability for young entrepreneurs and establishment of 2 new business support centers in Aizkraukle and Rokiskis. 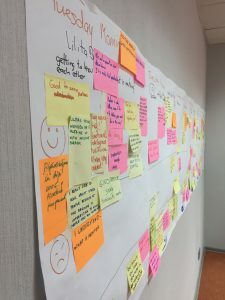 Project have an extra focus on use of modern technologies by creating joint platform what will connect all project partners support centers and their home pages in joint network with integrated advisory system for young entrepreneurs ensuring the possibilities to consult each interested party about each county legislation, rules, possibilities, etc. thus allowing practically consult also about cross border businesses. During the project it will be established mentoring network to support business survival and development in Latvia and Lithuania. There are existing a lot of support services for business starting, but project also wants to provide support network for new entrepreneurs who already are working and provide them with experts who can share their experience during several business activities. Project also includes provision of various educational and advisory activities like e-learning platform, local training seminars, business days, forum and workshops on products design and export and provision of digital tool for the export and marketing (will be possible to create brochures, video and movies) for business start-ups and export development. By creation of such joint business support system it will be created collective opinion how to promote business development and support innovative business ideas. Such network will allow setting priorities, including all business support institutions in Zemgale, Kurzeme and Northern Lithuania and concentrating resources on most valuable activities. 16. un 17.martā Aizkrauklē notiks “Uzņēmēju dienas” 2018, kas ir gada lielākais uzņēmējdarbības notikums Aizkraukles novadā un tuvākajā apkārtnē. Sauso 18 d. į Rokiškio Juozo Keliuočio viešosios bibliotekos Vaikų ir jaunimo skyrių – suaugusiųjų biblioteka renovuojama, be to, būtent šiame skyriuje vykdomas 2014–2020 m. Interreg V-A Latvijos ir Lietuvos bendradarbiavimo per sieną programos projektas „Verslo paramos sistemos kūrimas ir prieinamumas Žiemgaloje, Kuržemėje ir Šiaurės Lietuvoje“, LLI-131 (BUSINESS SUPPORT). Rinkosi smulkūs rajono verslininkai ir tie, kurie dar tik planuoja verslą – „Versli Lietuva“ atstovybės Rokiškyje, Darbo biržos, rajono VVG atstovai, žurnalistai. Šiek tiek pavėlavęs į renginį atvyko ir iki pabaigos jame liko rajono meras Antanas Vagonis. 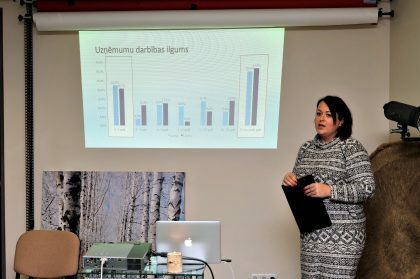 Latvijos mokslų akademijos (LMA) Ekonomikos instituto direktorė mokslininkė Nina Lindė pateikė minėto projekto lėšomis atliktą LMA Ekonomikos instituto atliktą Lietuvos ir Latvijos pasienio verslo paramos sistemos analizę. Buvo įdomu sužinoti, kas – latviai ar lietuviai – turi daugiau verslo galimybių bei optimizmo. Apvienot 100 pieredzējušus mentorus pārrobežu Mentoru tīklā uzņēmējdarbības attīstībai un uzņēmējdarbības uzsācējiem pieejamās atbalsta sistēmas uzlabošanai. Šādu izaicinājumu šogad uzņēmies Latvijas Lauku konsultāciju un izglītības centrs (LLKC), iesaistoties Latvijas – Lietuvas pārrobežu sadarbības projektā. Aizkraukles novada domes sēdē nolemts izveidot Aizkraukles novada Uzņēmējdarbības atbalsta centru, kura mērķis būs sniegt informāciju un konsultatīvu atbalstu personām, kuras ir sākušas vai vēlas sākt uzņēmējdarbību Aizkraukles novadā un tās apkārtnē. Deputāti apstiprināja Uzņēmējdarbības atbalsta centra nolikumu un iepazinās ar tā vadītāju Baibu Kelleri. Seminar -workgroup First steps in export. How to start? Seminar-workgroup First steps in export. How to start? Workshop - Working Group "Opportunities and challenges in the most popular export destinations (Scandinavia and Germany)"
Networking Workshop "Opportunities and challenges for entrepreneurs in cooperation in science"
Find the most suitable business form for you and find out about Latvian taxes "
Training "What you need to know when starting up an export market!" Training, Communication, Collaboration, Support - What is Enhancing Business? Business Conference " Business Support Methods, Their efficiency"
Meeting with members of the cluster "Enterprising library"
Training "Generational gap in the workplace: challenges and solutions 2019"